A lesson for before or after Thanksgiving Break! 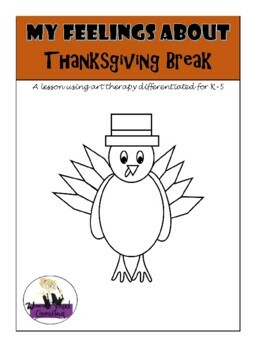 Students will identify how they are feeling about Thanksgiving Break and why. NOT ALL STUDENTS ARE EXCITED FOR THANKSGIVING BREAK! 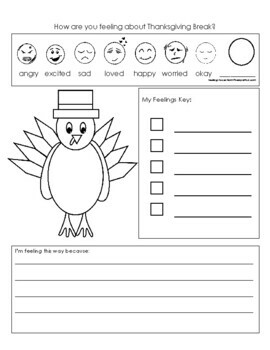 This is a great way for all students to express how they are feeling in a non-threatening way. The lesson plan is appropriate for PK-2, possibly 3. Worksheets are differentiated for PK-5. 1. 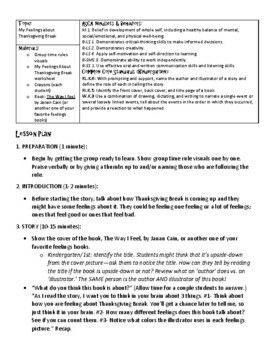 Lesson plan aligned with ASCA Mindset & Behaviors. Also aligned with Kindergarten Common Core!